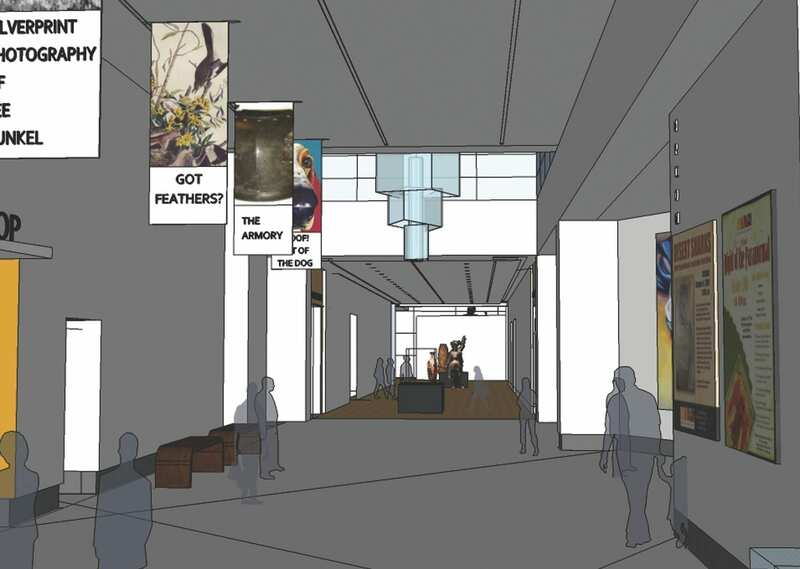 Adding space to an existing museum to improve its functionality can be a daunting challenge. 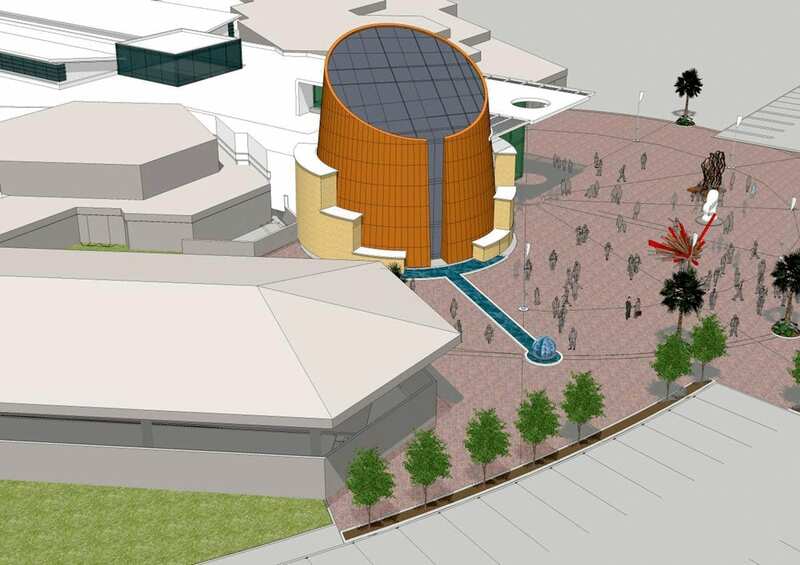 Confronted with such a scenario, the Daytona Museum of Arts and Sciences turned to a competition to arrive at an innovative solution to its expansion plans. 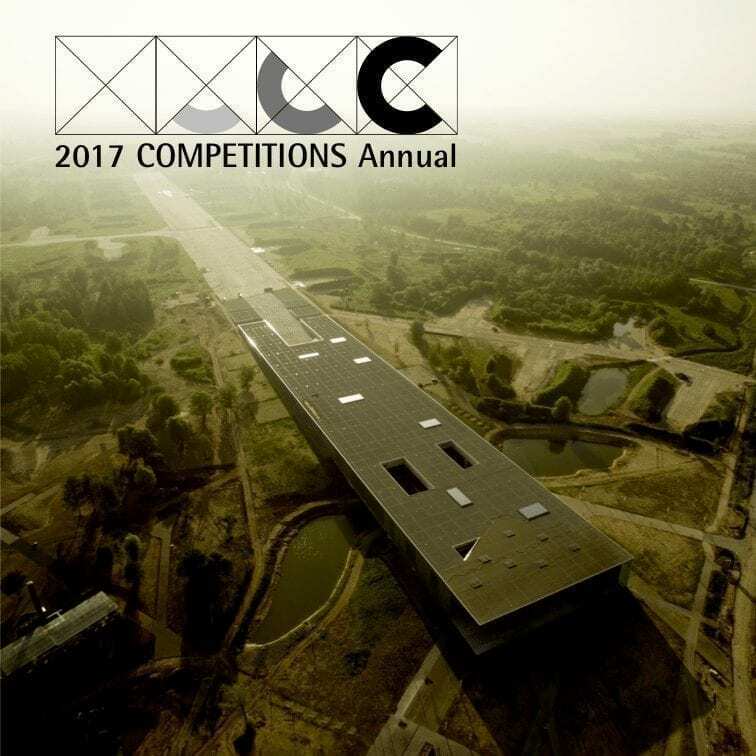 Limited to architectural firms based in Florida, the competition was conducted in two stages — the first stage consisting of a short list based on expressions of interest, followed by a submission of designs by finalists. 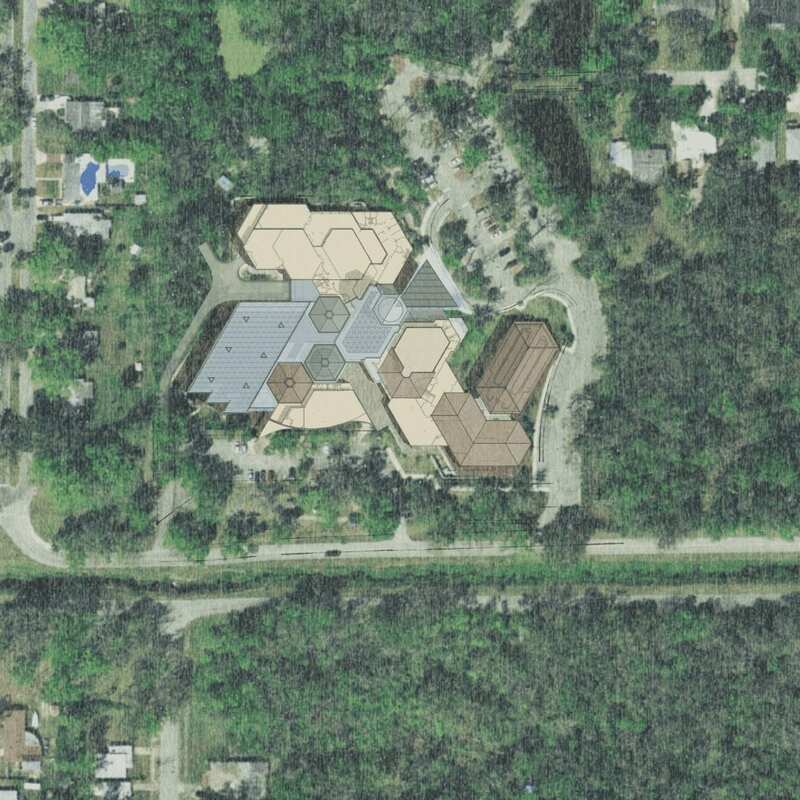 The history of Daytona Museum of Arts and Sciences (MOAS) is similar to many museums, in that new wings were added to accommodate a larger collection. The level of the West Wing of the museum, located 30” below the main structure, can only be reached by a ramp, and is prone to flooding. 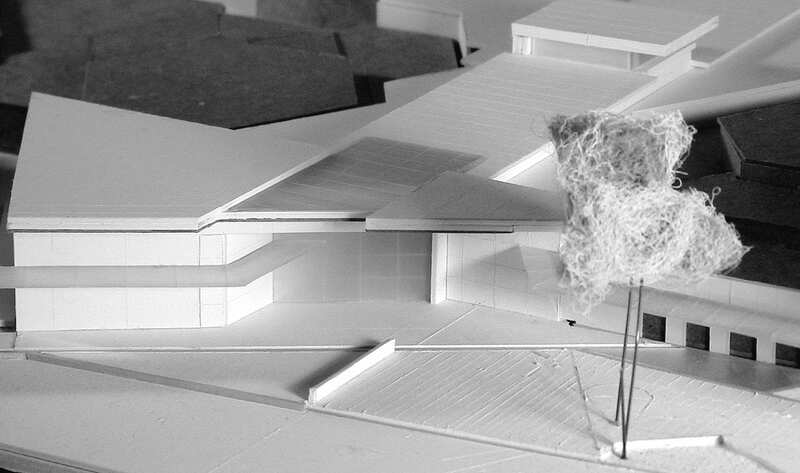 To eliminate the need to move exhibits from this wing every time it is threatened by water, MOAS decided to demolish the existing wing and build a slightly larger structure to replace it at the same level as the rest of the museum complex. 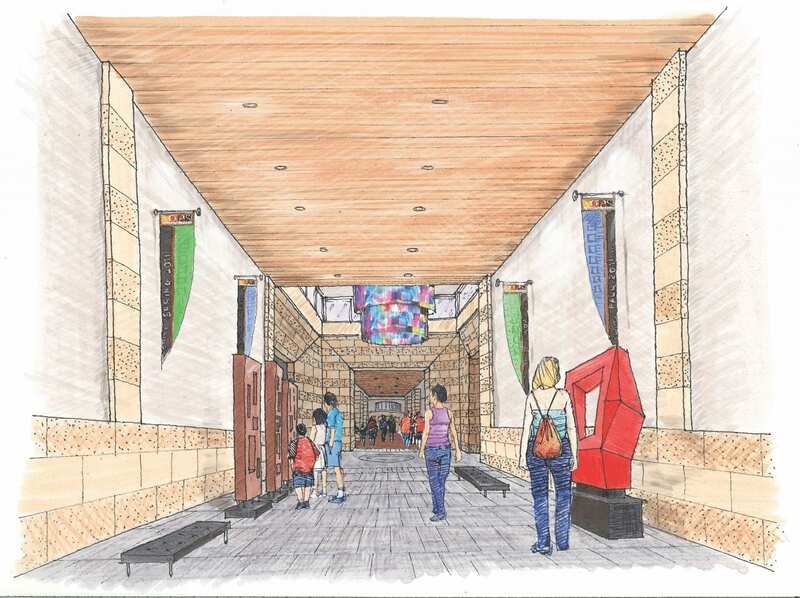 At the same time, they wanted to address the expansion of an entrance lobby, with the intention that it also be used for special events. 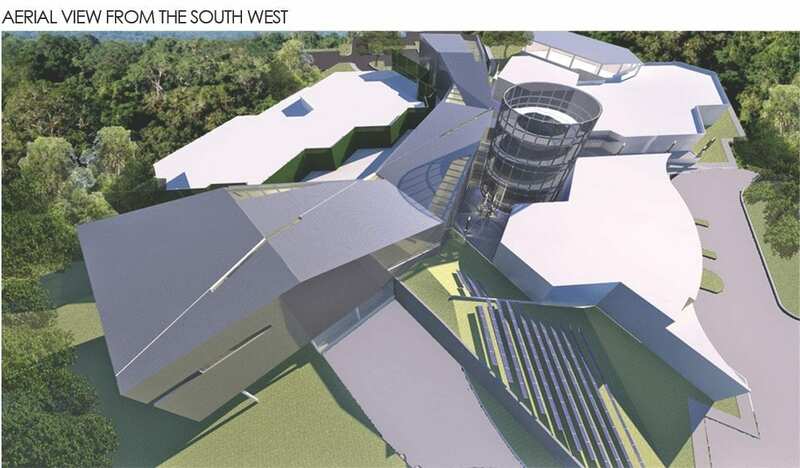 The latter was considered to be a second phase if sufficient funding did not become immediately available. However, this latter phase of the program is certainly important to the image of MOAS, because it would provide it with a new sense of arrival for visitors. As a multi-functional museum, MOAS is home to various types of activities and exhibits. 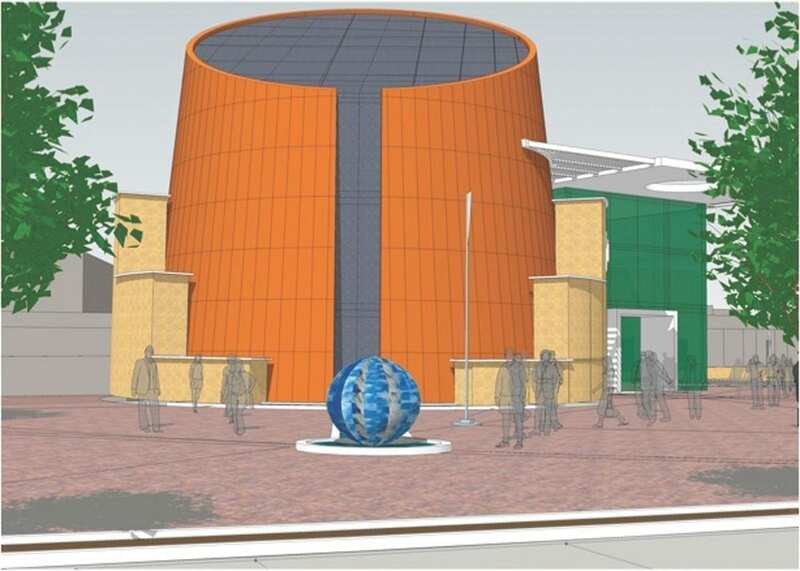 In addition to a planetarium, its collection includes natural history, archeology, science, and art — Cuban, American, Afro-American, crafts and even a Coca Cola exhibit. As such, it has a major educational component as its mission. Combining so many different agendas might be considered a weakness of mission by many museum administrators; but here it can also be an advantage, bringing many visitors to a site where they can be exposed to a large variety of subjects that otherwise might not be high on their list of priorities. 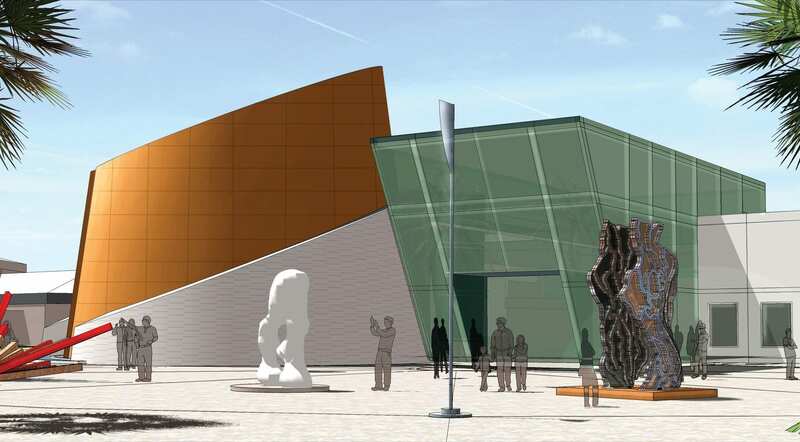 The museum’s $7.5 million budget for this expansion might be considered modest by comparison with expansion plans of some museums: the San Francisco Museum of Modern Art’s expansion will be in excess of $200 million; Louisville’s Speed Art Museum’s expansion budget is $79 million. 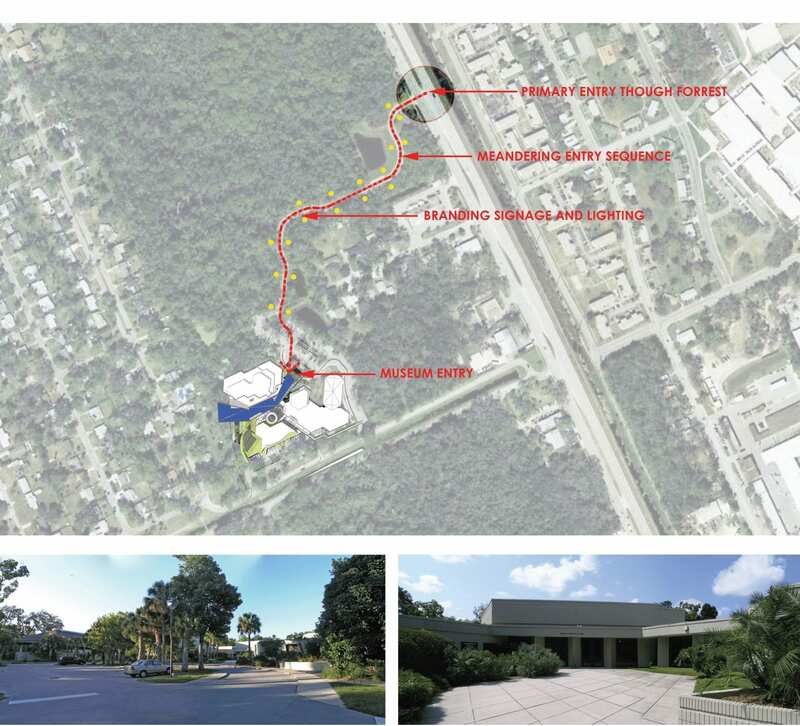 Still, for a relatively small community, where snowbirds make up a considerable segment of the local population, this plan is ambitious in its own right. The budget for for new West Wing, including demolition is approximately $6 million. 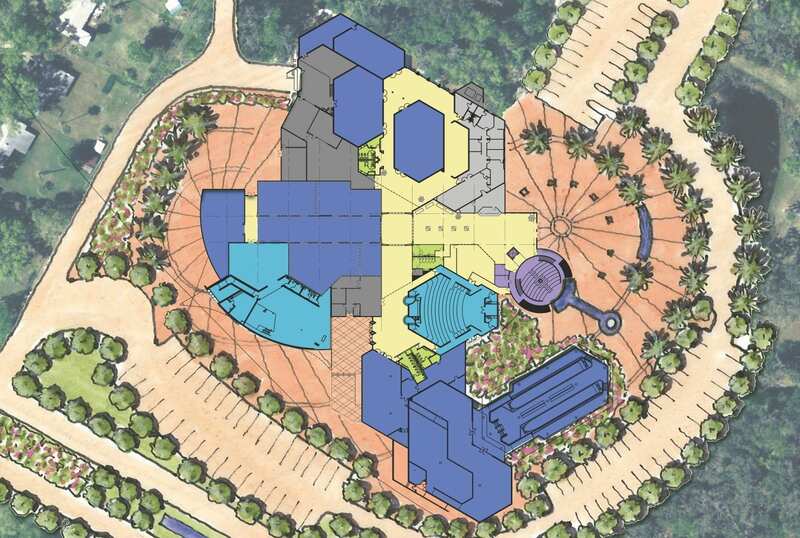 If the new entrance, Grand Lobby design and Observatory are added to the mix, the total will be slightly over $7.5 million. 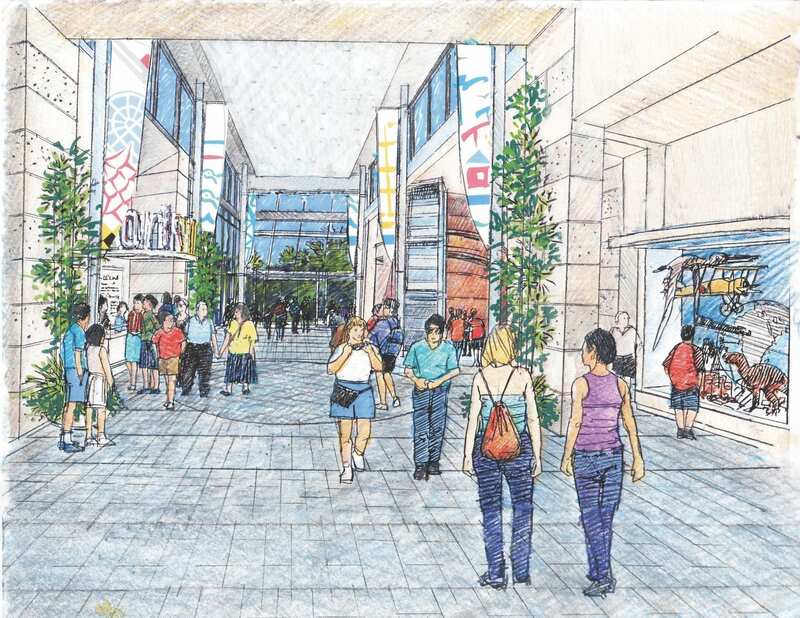 Initial presentation drawings by ©VOA. 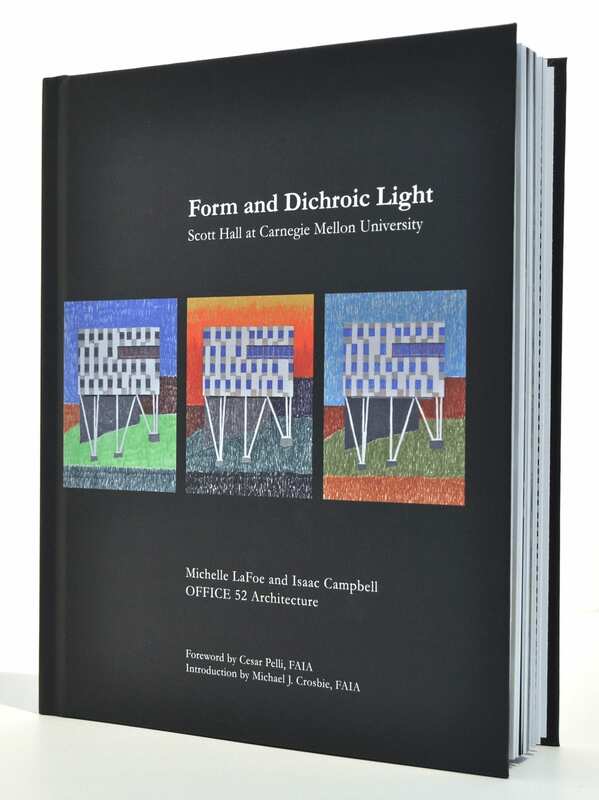 The design was refined after jury input. 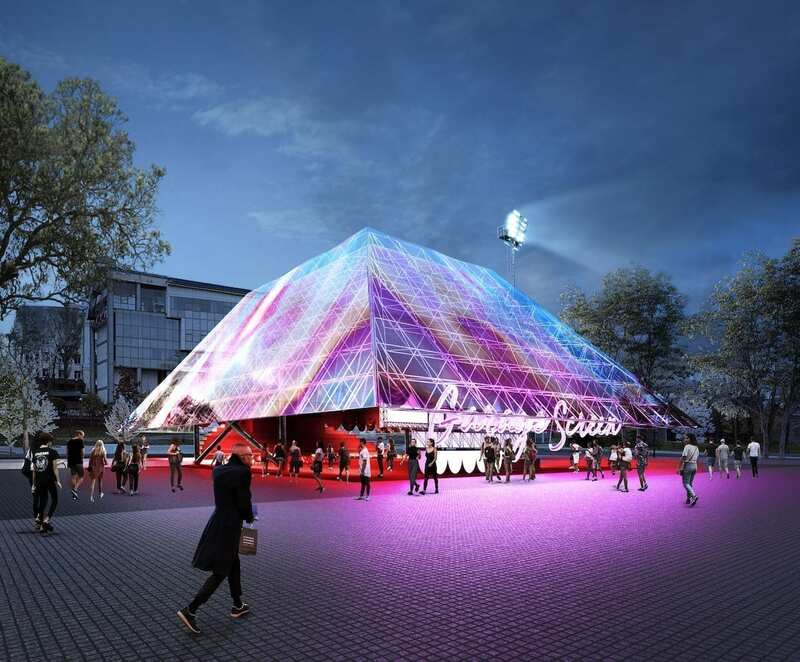 Upon submitting their proposals, each firm was to receive $5,000 in compensation. 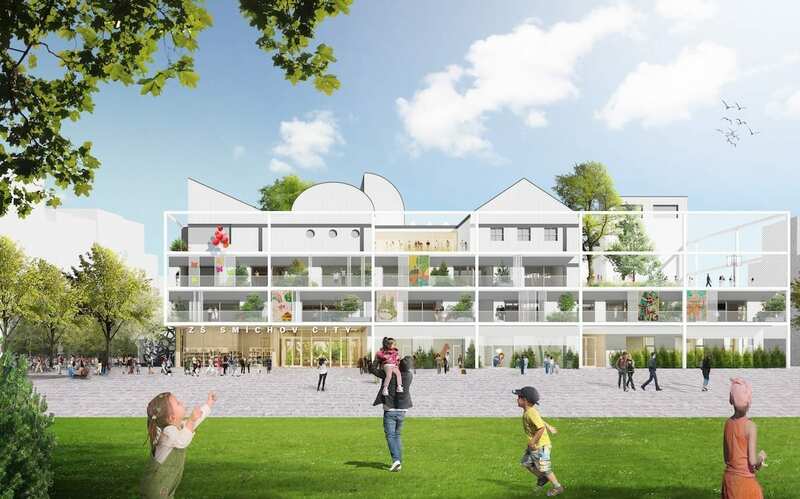 Granted, this was a small sum to cover the costs of entering an invited competition, considering a required minimum of four boards with site plan, floor plans, elevations, sections, and perspective views. There was provision for the display of models; but this was not a requirement. The jury was composed of 3 museum board members, the museum director, and an invited individual. The initial presentation by the teams was accompanied by comments from the jury, and the firms were then asked to refine their designs. When the final presentations took place, VOA was declared the winner, with ADG ranked second. 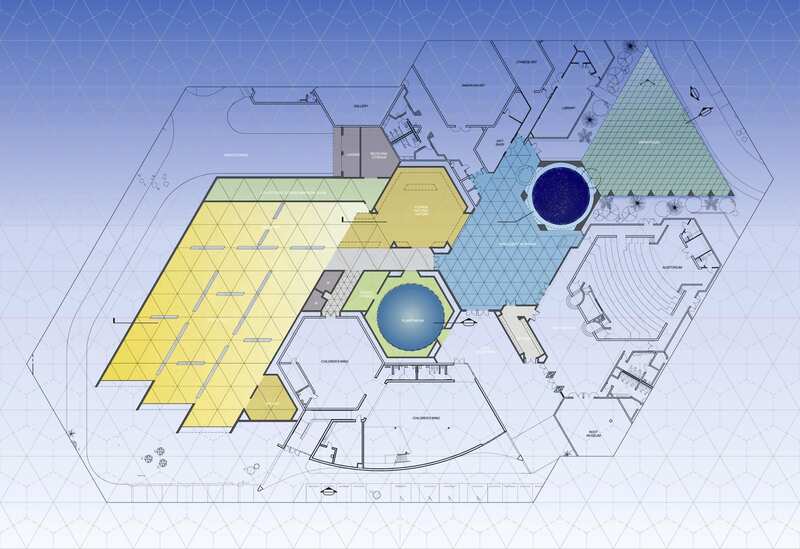 By moving the Planetarium from the interior of the MOAS to the entrance, the initial winning VOA proposal not only created an iconic arrival feature, but allowed for it to stay open for visitors when the rest of the museum is closed. 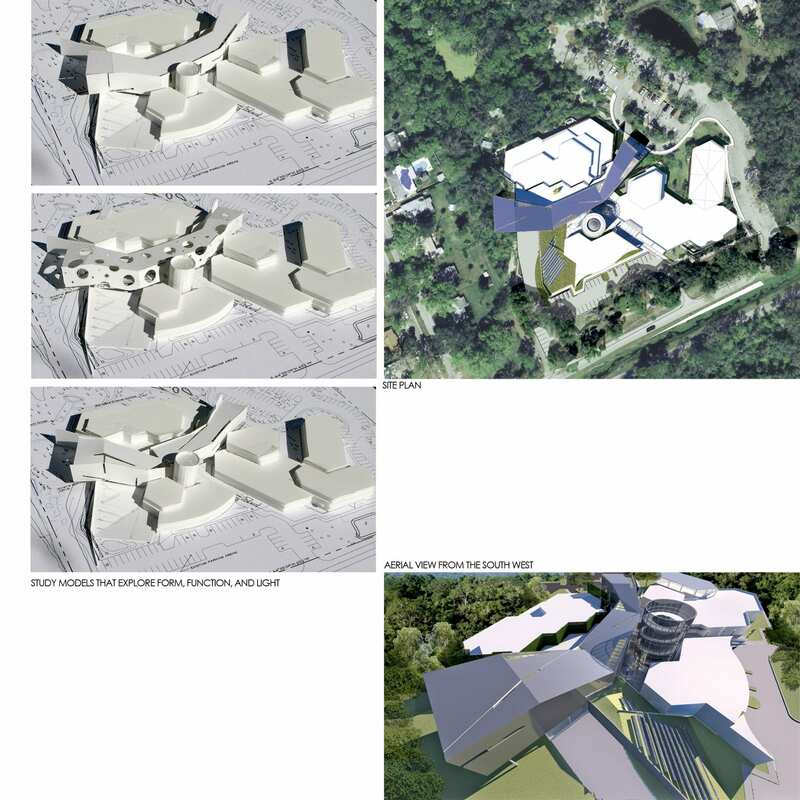 When comparing VOA’s original presentation with its final plan, the most notable change at the front entrance is the lower visibility given to the Planetarium due to its incorporation into the main structure, but still maintaining its own private entrance. 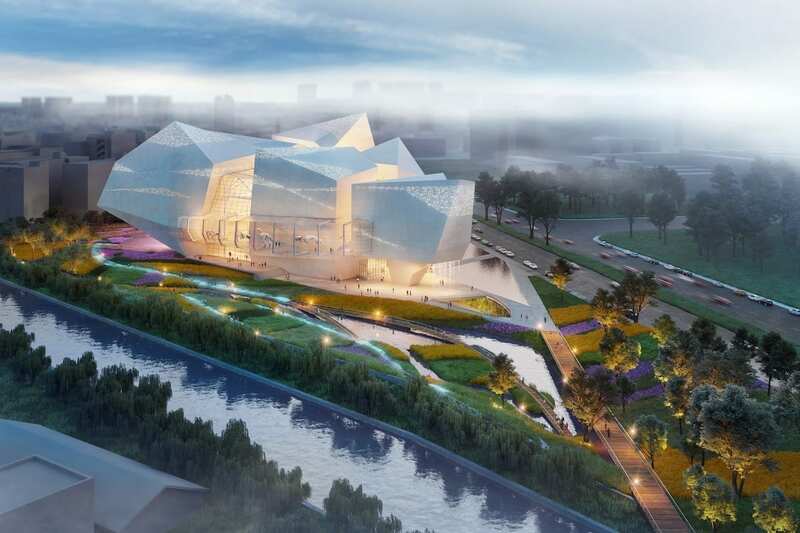 According to Jonathan Douglas, VOA’s team leader, the jury thought that VOA’s initial presentation placed too much emphasis on architecture to the detriment of the art collection. 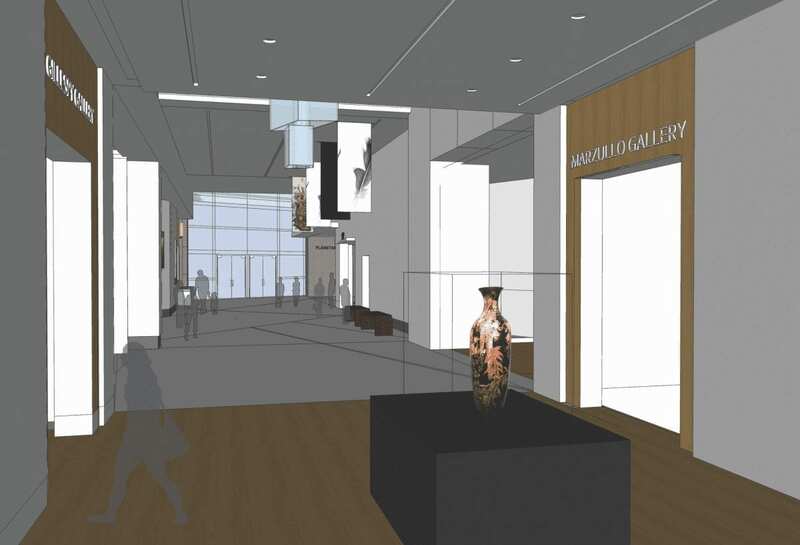 Also, the interior “street” extending from the entrance to the new wing appears to be less grander in scale in the final scheme. 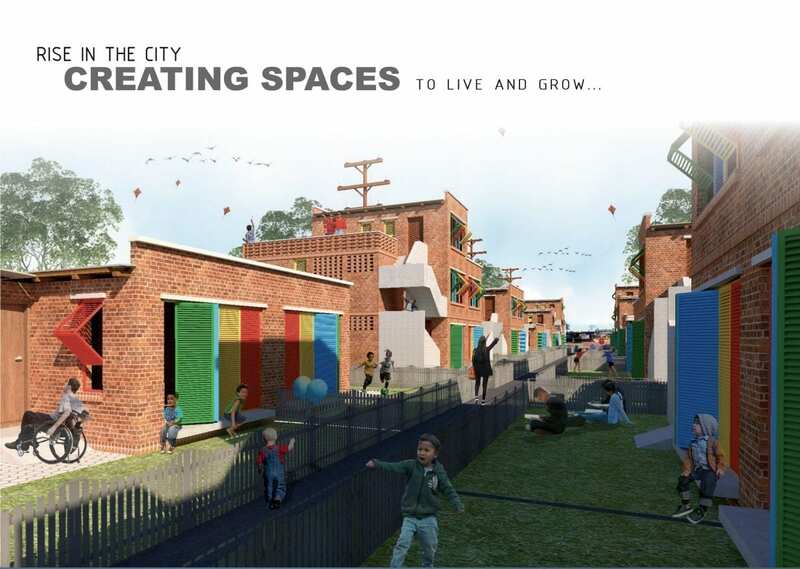 In comparing the two presentations, the final design would seem to provide a more intimate space for viewing. 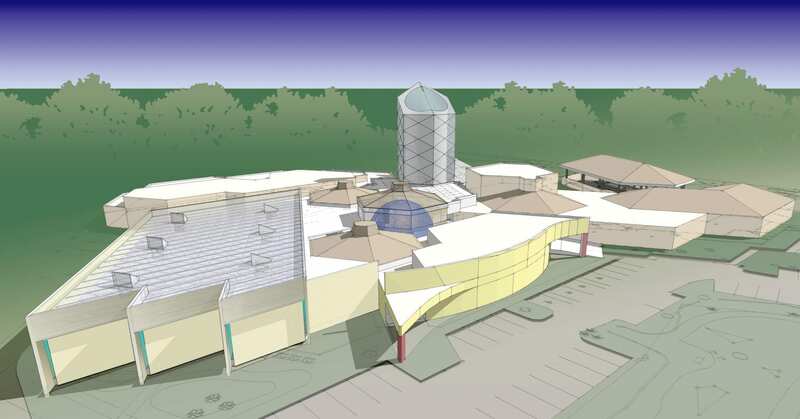 One might also assume that incorporating the Planetarium within the main structure might even reduce the budget. 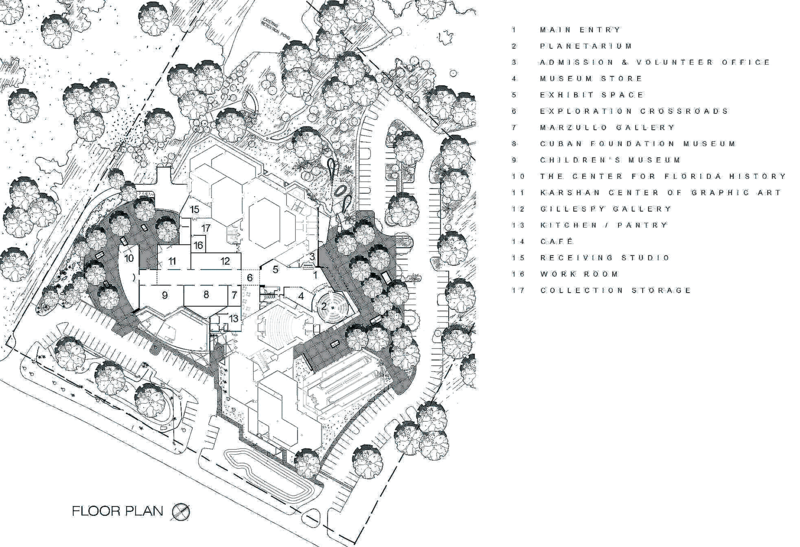 Second Place Architects Design Group (ADG) from Winter Park concentrated the program along a central spine, being the only competitor to locate a major part of the program on a second level. 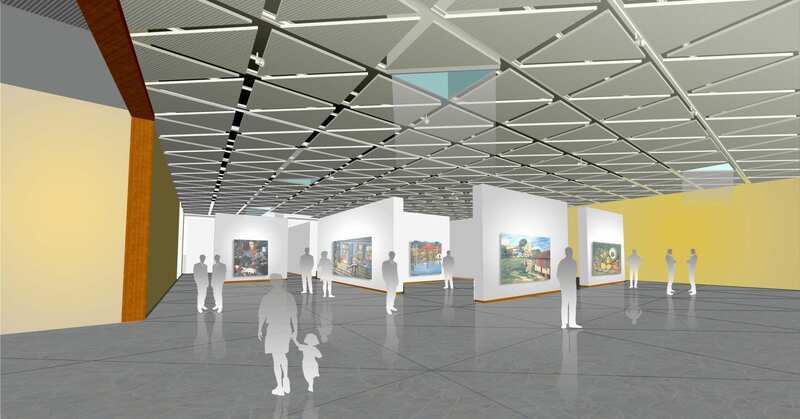 This included a gallery for temporary exhibitions perched above the main entrance — part of the second phase expansion of a new entrance. 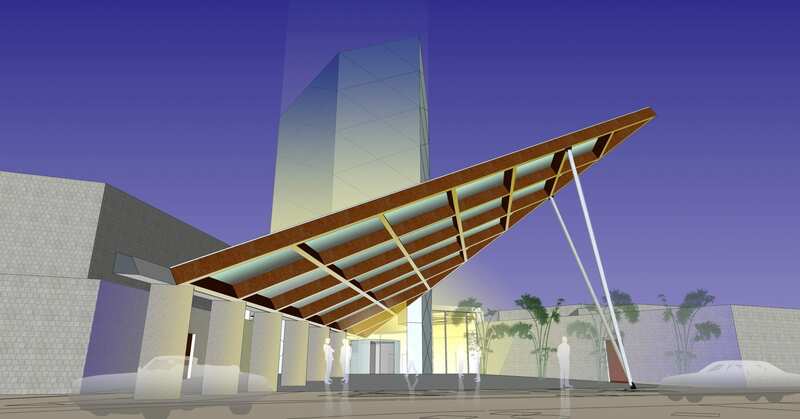 Also, by including a second level, it also provided for access to a rooftop sculpture garden. 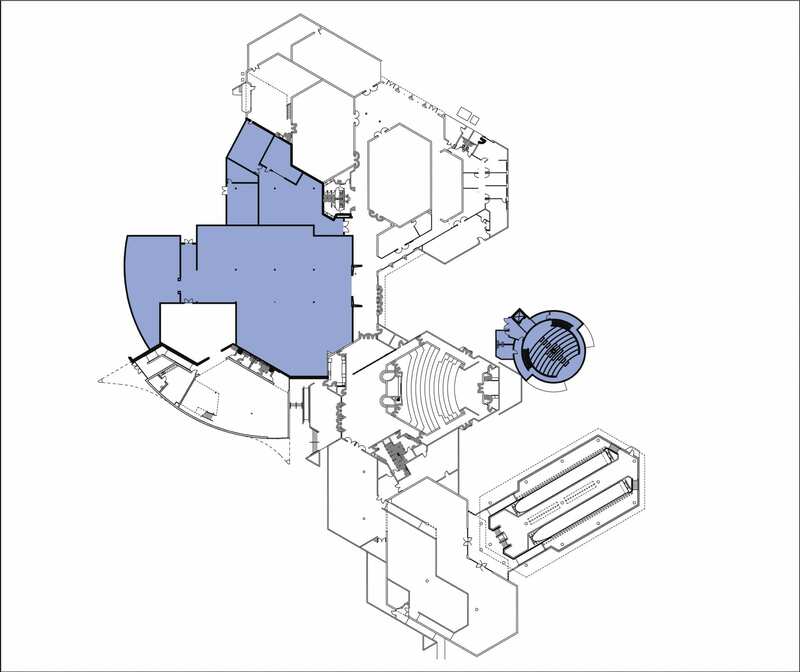 The planetarium remained in the interior of the building, and, by using the two-tier plan, added space to the outside where the previous West Wing had been located. By using the central spine as an activity generator, this plan is notable for its compact nature, concentrating the program into a smaller footprint. By doing so, the ADG team was apparently looking for a way to arrive at a higher energy quotient. 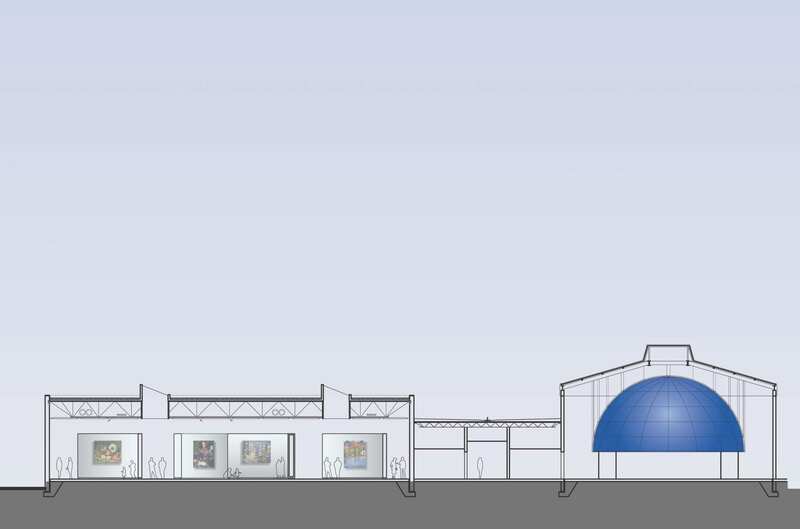 On the other hand, the compact nature of the plan would hardly have provided an ideal space for large gatherings; the alternative being staging such events in the gallery for temporary exhibitions. 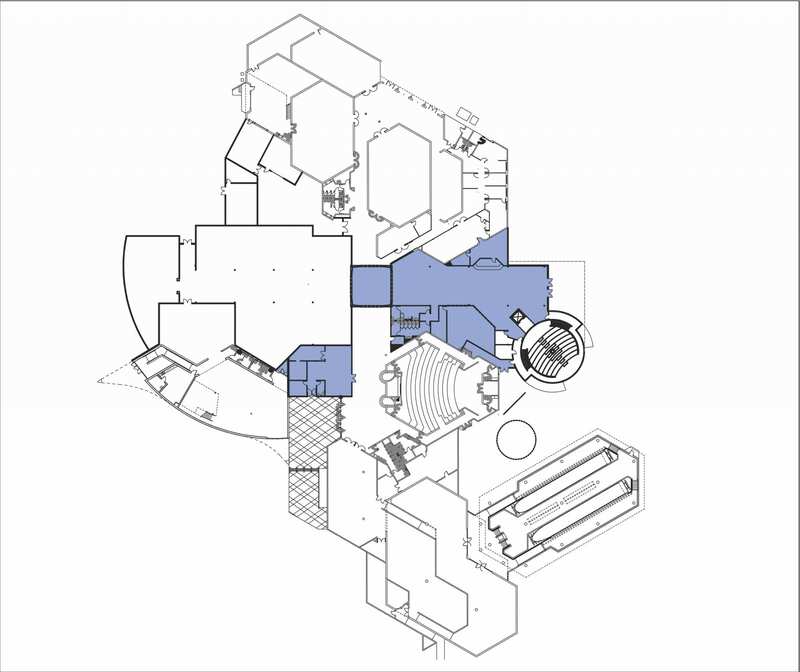 HOK’s plan was probably the most straightforward in that it made the fewest internal changes, designating the former West Wing area as a large exhibition space. 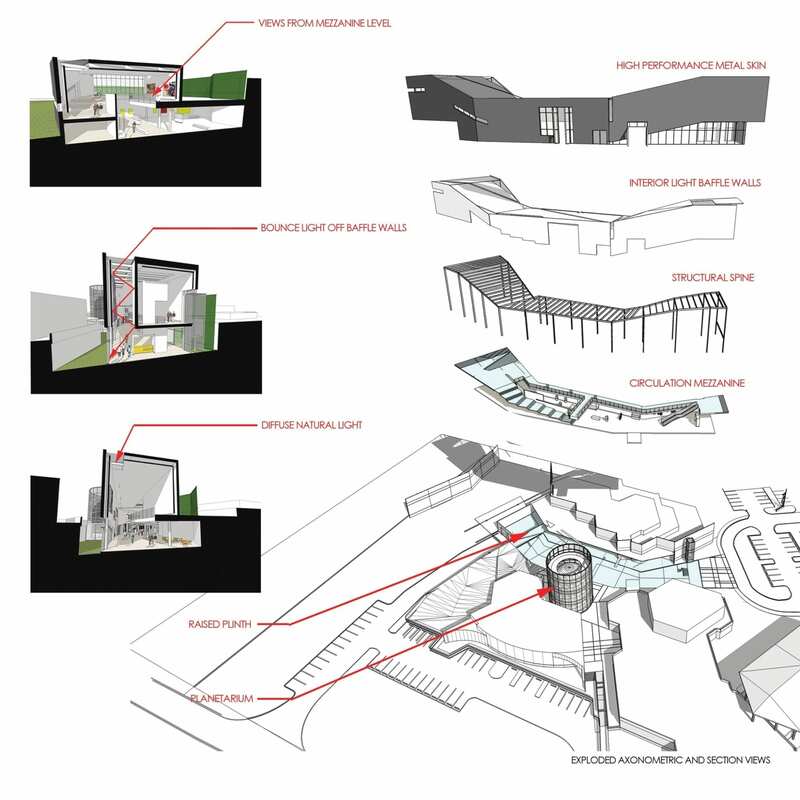 The idea here was flexibility, as the exhibition space could be configured to accommodate either one large, or several smaller exhibits. 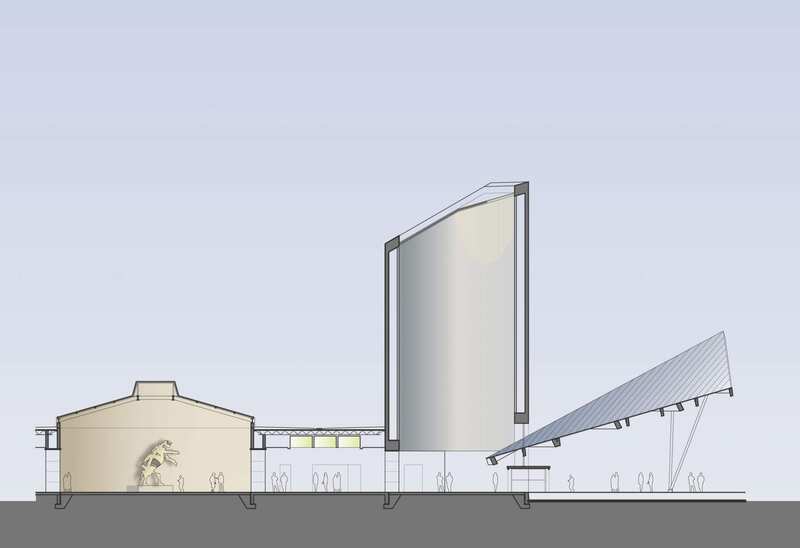 The iconic architectural feature of the HOK plan was a Sun Tower at the entrance, intended to raise the museum’s visibility in the neighborhood and from the distant road. The Sun Tower also had an instructional purpose, with a small opening in the ceiling allowing sunlight to penetrate, not only indicating the time of day, but also seasons of the year. A fiber-optic design of the cosmos in the floor—possibly powered by solar energy—was part of this educational concept directed to the large number of students visiting the MOAS. By staging this competition, MOAS not only got a very valid design to refine and energize the institution, the thoughtful plans presented by the three finalists no doubt led to a better circulation solution than would have been the case had a direct commission been tendered. 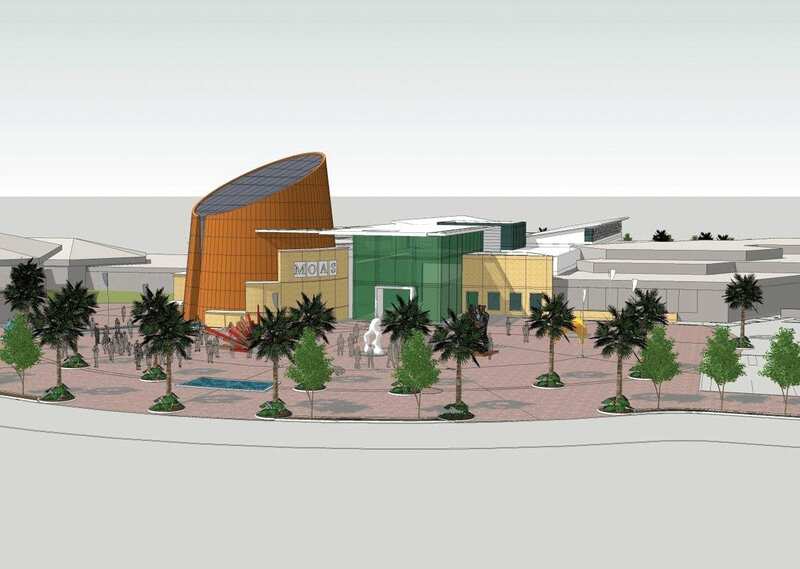 Now in the final stages of acquiring the necessary grants to realize this project, residents of Daytona Beach can look forward to a building which will have a much higher visibility in the community.